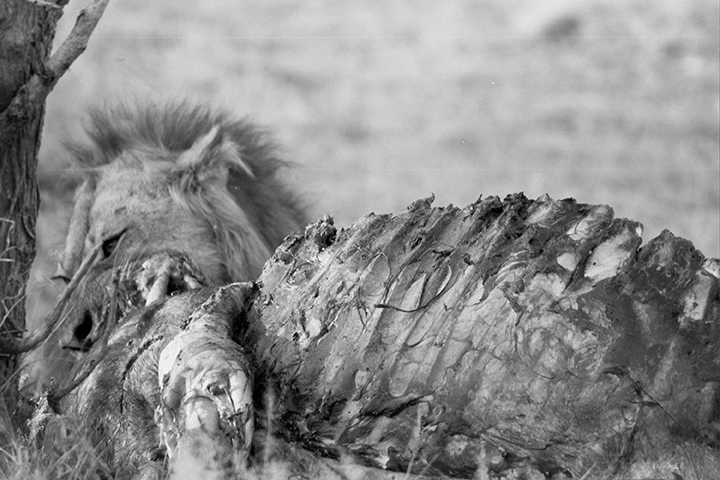 Competition for land and trophy hunting have decimated lion populations. In antiquity, Roman elite imported wild animals — including countless lions from Africa — for processions, celebrations and gladiatorial exhibitions where the animals were often killed. In the first century BC, 20 elephants, 410 leopards and 600 lions were killed in a single spectacle. When I was 15 and heard my first lion roaring in the Chyulu Hills of southern Kenya, their population may have numbered 100,000 or more. Today, there may be no more than 15,000 lions throughout Africa. An elder named Bom carried a scar from an old lion that jumped on him when he was a young man, and he proudly wore the scar like a talisman. On this day, he shared another story with us. One day, in the early morning, after one of their all-night trance dances, Bom and his friend heard a lion roaring. The roar dissipated, but not before everyone had been alerted to the animal’s proximity. The senior men went out into the bush to try to find its tracks in the vast Kalahari sands. They found lion paw prints not far from their camp and followed them for a distance. They then saw that, amazingly, the tracks became human footprints that made their way toward the next San settlement a few miles away! 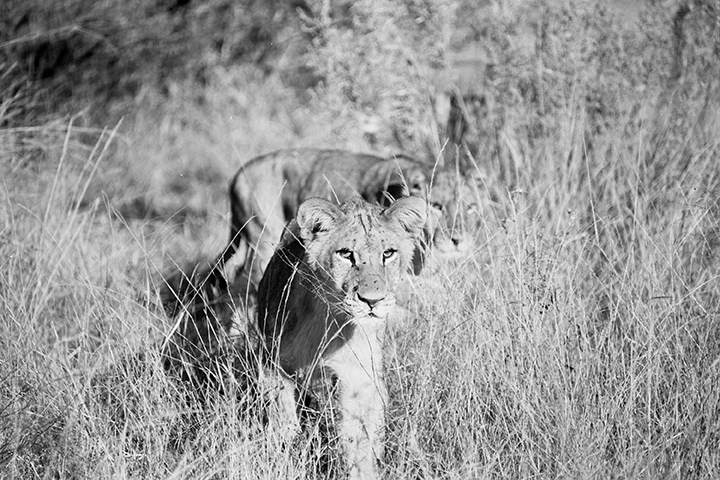 In 2002, we followed two male lions who were about to cross the Zambezi River. We waited about an hour to see what they would do as the dark obsidian silence of sunset took over the land. They hid behind some bushes, ready to make a quick getaway. Our guide waited too long, however, and to my consternation the lions vanished before we had a chance to see what would have been a miracle moment: two lions, perhaps refugees from Mugabe’s regime, swimming across the river that separates Zimbabwe from Zambia. In Samburu, Kenya, that same year, we were privileged enough to witness the lion called Kamunyak (“the blessed one”) adopt an oryx baby, perhaps three weeks old. This act astonished biologists and reminded everyone the world over that the lion could indeed lie down with the lamb. There are ineffable moments in the bush, such as one we had watching a white lion in 2010. We had heard stories of the mystique of the white lions of southern Africa, perhaps the most revered animal on the continent to the Shangaan tribe of Timbavati. Seeing a wild white lion eating a kudu was a miracle to behold. Lysander felt something of the spirit of Aslan from Narnia come to life. 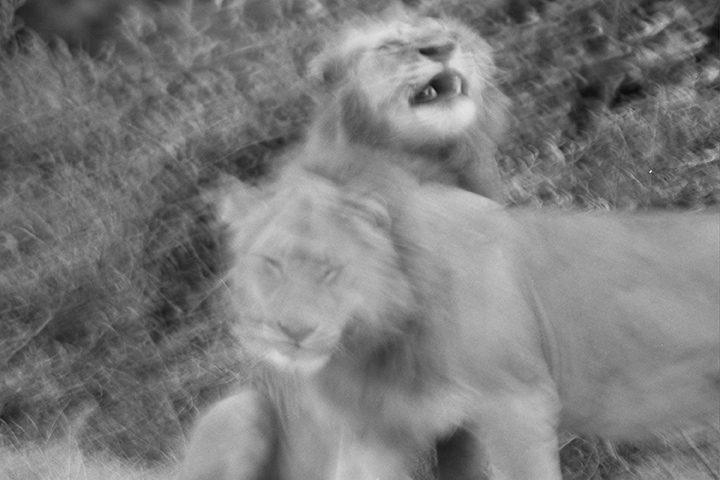 The Shangaan believe that if the white lions were to disappear, the entire ecology would collapse. The lion’s place in the ecosystems of Africa is now under siege — how humanity responds to this crisis will not only be a deciding testimony of the future of an entire continent, but will also determine the legacy of what our species means on this earth. In Gemsbok National Park, which straddles Namibia, Botswana and South Africa, we were transfixed by numinous tales that go back millennia. We heard stories of shape-shifters who still honored the lion. We were told that one must never stare directly at a lion, and that it was advisable to obliquely walk away if one met a lion in the wild. We headed into the desert and witnessed wildebeest, giraffes and oryx for a week, but the lions eluded us. It was not until three hours before sunset on the last day of our stay, when we were supposed to head back to the gate and meet our San host, that we saw the tip of a black-maned lion’s head peeking up out of the red dunes. We waited for 40 minutes before our guide told us we should head back to camp. Marie saw the lion move and, recalling similar motions from our own cat on numerous occasions, decided we should wait just a little longer. 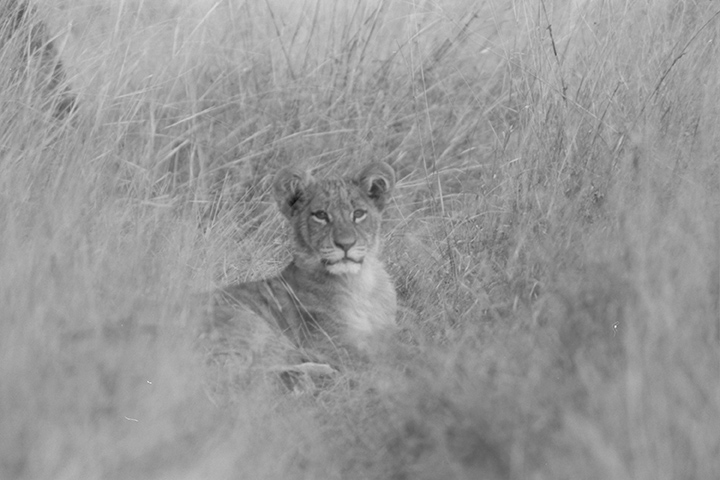 Suddenly, the lion sat up and watched us. He was then joined by two females who caressed each other with the male looking on like a true nobleman. Two more females then joined the others from behind the sands. The intimacy of the moment was heightened when the entire pride walked by our cars, the four females following the male in single file — a fantastic procession to end an otherwise uneventful week. We followed them for several miles until they stopped on another dune as if to watch the resplendent African sunset. It was remarkable — if we had met our host at the gate as planned, we would not have had the opportunity to spend time with the famous black-maned lions we had come so far to see. Upon our return to the gate, our host (who was a man) happened to be accompanied by four female friends, just like the lion! In some indescribable way, it felt like the spirits of our awaiting hosts had somehow been transferred to those very lions, there in the back of the beyond, where mystery and synchronicity collide. In this age of the synthetic and of artificial intelligence, it is lessons such as these in a wilderness of silence that will ultimately be regarded as the great teachers of our time. Elephants have always amazed Lysander, but lions have been consorts to the cats we honor in our own households — cats that mesmerized the entire ancient civilization of Egypt. We tend to look for the marvelous in the grandiose and majestic, but it can also be found in the small and diminutive. In 2017, a guide asked Lysander to join him and crawl on his belly to greet a few young lion cubs while the mother was hunting. Our guide was doing what few other guides would ever do, but he had seen his father approaching and interacting with young lions for a generation — he knew their stride, their movements, their sense of timing and what was reasonable from what should never be attempted. 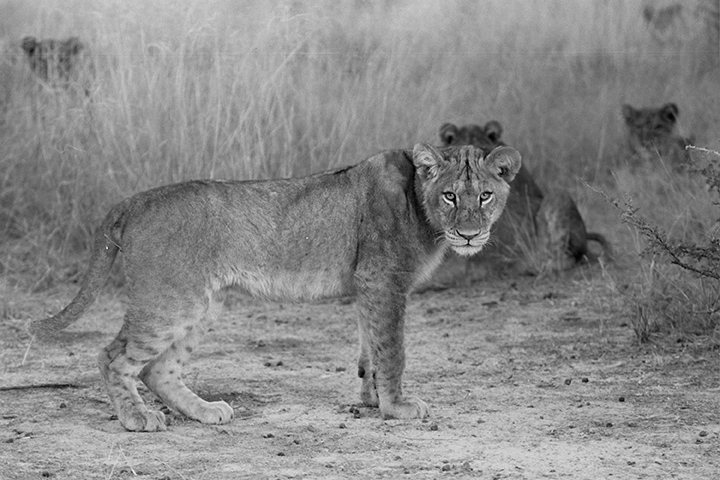 Our guide approached the young cubs within twenty feet, crawling up to them as just another curious animal, never instigating any action that would seem hostile or cause them to flee. That moment was based on the trust of cubs still playing in the innocence of young lionhood and who had yet to learn to be hunters. For millennia, there has been a living arrangement between lions and the first peoples of Africa, a truce that is unmatched on earth. One group of lions’ chorus would intone with other groups of lions, following each other with deafening roars. It was sounded not just to signal other lions, but for the sake of the San people as well. To let them know that they were powerful hunters and they both depended on the same food. They let the world know that humans and lions were living in proximity to each other and in fellowship! Our species is trying to meld with the machine, with artificial intelligence, with robots, all at a time when we should be restoring our relationship with those beings who have helped define us spiritually, ecologically and morally for as long as our species has been on this planet. The Ju/Wasi once explained that humans and lions are only enemies when we make them so. We have coexisted, and we still can. Trophy hunters, many of them Americans, are impacting the genetic pool of lions and indeed all trophy animals. Such depravity will one day be outlawed worldwide, but what will be left of the wild? With climate change, lions may very well be facing an even more difficult future. We need lions and tigers and bears and bees and frogs and whales more than ever before. Without them, we will simply cease to be human. Today’s fads of trans-humanism and the possibility of downloading the brain into a machine are a sad move away from what we should be returning to, our organic selves. That is perhaps why Lysander once exclaimed that “Africa was the introduction to the alternate Self.” If we lose the animals, gadgets may be all we are left with. The Maasai used to pit themselves against lions but only for the valor of their clans. Across East Africa, they are now lion guardians. In contrast to the moral cowards who kill for fun, the Maasai risked their lives, either alone or in groups, to confront an equal warrior, the lion. Charles Lindbergh, in his Autobiography of Values (1978), tells us of the time a Maasai elder told him, “We have known a freedom far greater than yours,” alluding to the ultimate freedom of belonging in the world with cohorts such as the lion. In this time, we are killing the supreme hunters, those who have always been our supreme teachers. We desecrate beauty with vanity, grace with perfidy. If humanity is to survive, we must hold ourselves accountable. The time draws near when we will find out decisively if we are the saviors of species or their slayers. The fellowship Lysander had when he crawled on the ground to face his fellow beings — beings who influenced human evolution eons before they were painted on the cave walls of Chauvet — was a restoration of hope in this fragile time. We must all learn to fully recognize the importance of lions and our interconnectedness with them before it’s too late. Photos owned by Lysander Christo, and cannot be used or reproduced without permission. Cyril Christo, and his wife, Marie, will soon release their 10 years-in-the-making feature documentary about the future of the elephant, and with their son, Lysander, are working on their new book, Lords of the Earth — the Entwined Destiny of Wildlife and Humanity. Photos owned by Cyril and Lysander Christo, and cannot be used or reproduced without permission.